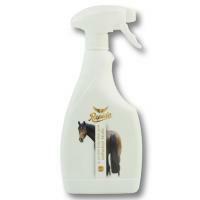 Set 2-Pcs a neutral pH shampoo for horses Rapide, in practical spray. Convenient pack of 2 pieces of specific treatment shampoo for horses Rapide. 2 bottles of 500 ml. The spray applicator ensures a good distribution of the product, eliminating the risk of loss and waste. Improving the application of the product, in the desired quantity, you save a considerable amount of product that would otherwise be wasted. 2 x 500 ml.